A few years after they stopped working on the Superman comic books, Jerry Siegel and Joe Shuster came together once again with the intent to create another icon of comics. Their new character, Funnyman, was a mix of Batman and the Joker with a healthy sprinkling of comedian Danny Kaye. 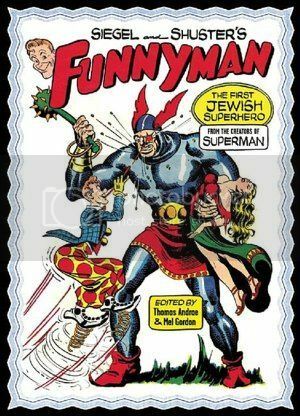 Their effort to create the next big thing is chronicled in “Funnyman: The First Jewish Superhero” by Thomas Andrae and Mel Gordon. But the book isn’t just about Funnyman. It chronicles the origins of superman, explores the personalities of the two creators (with a particular focus on writer Jerry Siegel) and a look at how Jewish humor has evolved over the years. It also includes a selection, but not a complete reprinting, of some of the Funnyman comics — including the comic book stories and some of those that appeared in the comics pages of newspapers. For the uninitiated, it’s OK if you’ve never heard of Funnyman. Unlike their Superman creation, Funnyman stalled out quickly and was never more than a blip on the radar of kids in the 1940s. Even today, collectors are largely uninterested in Funnyman comics. Funnyman was essentially a failure. The book tries to figure out what went wrong with the creation and why its creators thought it might actually transform into another global phenomenon. The origin of the character is quite simple. Funnyman is really comedian Larry Davis who decides on a lark that he should also be an undercover crimefighter. He uses his zany humor and an array of gadgets to battle his foes. To keep himself from being discovered, he dons a clown-like nose and a crazy outfit. Still, his Lois Lane-like girlfriend, June Farrell, knew his secret. While there’s plenty of analysis about Funnyman’s creators, the most interesting part of the book is to see the old Funnyman stories and comic strips. Prior to picking up the book, Comics on the Brain hadn’t ever even heard of the character, so getting a chance to read some of his adventures was a treat. That being said, the stories were remarkably uninspired, even if the art was remarkably good — dare we say good enough to be published today. Writers Andrae and Gordon offer plenty of context about the origin of Superman, the legal troubles between his creators and National Publications, their Jewish backgrounds and how those elements culminated in the creation of Funnyman. Those theories are definitely interesting and offer some valuable insights on this footnote of comic book history. That, however, is the ultimate problem with any analysis of a character as obscure as Funnyman. His story isn’t very significant to the history of comics as a whole. He’s no Spider-Man. He’s no Plastic Man. He’s not even a Spirit, a Mr. Fantastic or a Ragman. And he’s definitely no Superman. So, in the end, the joke really was on Funnyman.